Aside from an endless supply of baked goods, a cottage vacation usually means taking a break from buying food and preparing it ourselves. After being in the sun and relaxing, it’s nice to take time to cook and not abide by schedules. Nonetheless, one evening we gave the barbeque a rest and made our way into the quaint main street in Gravenhurst for dinner. When a menu proclaims something as the restaurant’s “famous” dish, I’m intrigued and will give it a try - an order of the deep fried chicken wings ($12.99 for 10 pieces) started us off while waiting for the mains. With thirteen sauces and seasonings to choose from, the Oar & Paddle has a decent selection. 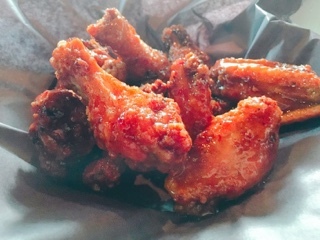 The sweet and spicy Thai lived up to its name in terms of flavour and the wings were good – juicy, crispy, freshly out of the fryer, and covered with an ample amount of sauce. Certainly not the best wings I’ve ever eaten, but would likely be a top 20 contender. 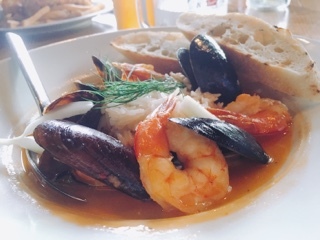 For a city by the water, I thought their bouillabaisse ($19.99) would be equally satisfying. To be fair, it had the beginnings of being a promising dish with a nice selection of seafood: perch, shrimp and mussels. Except for the shrimp, which were slightly overcooked, the others arrived flaky and plump. 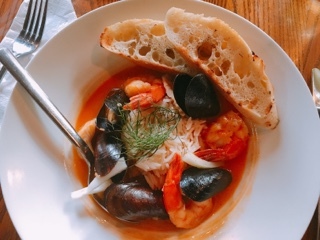 However, what makes a bouillabaisse nourishing is a hot hearty broth – something aromatic that hits the nose as soon as the dish arrives and a depth that makes you want to drink every last drop. Somehow, the lukewarm lackluster tomato and clam broth just didn’t cut it. At first excited to see the bouillabaisse would be served with both rice and grilled baguette (more vessels to soak up the broth), the rice was probably a poor choice as the hunk of cooled made-hours-ago starch ultimately left the soup tepid. 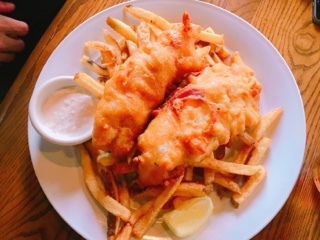 My husband was smart and stuck with the steadfast fish and chips ($16.99), a popular choice amongst the diners. The haddock was encapsulated in a crispy beer batter - although it could stand to be harder in the centre, the crunchy edges I tried were wonderful. The fries were also hot, plentiful and satisfying. And thankfully, the restaurant made their own tartar sauce so had plenty of gherkins and flavour – I’m amazed at the number of places that ruin fish and chips by giving the packaged Heinz variety. The Oar & Paddle is a Muskoka favourite and the place was full (both in the dining room and patio) during our Thursday evening visit… you’ll want to make a reservation. Laid back and homey, you don’t feel judged arriving in whatever you’ve been wearing at the cottage that afternoon (covered up of course). Just heed my advice and stick with the pub favourites, anything not grilled or deep fried may result in disappointment.